As per the recent survey says that there is an increased number of smartphone users worldwide may reach more than 2 billion by the end of 2019. It expected to reach more than 2.56 billion peoples using mobile ecommerce transactions over the annual. Adopting a mobile app in the ecommerce business helps to improve productivity, as it attracts and engages more customers across the globe. The mobile app development is one of the ideal strategic actions performed in today’s enterprise business. It acts as a powerful tool that drives more traffic and boosts ROI so it is important to invest in the mobile app development process. However, it is common that mobile app development cost of ecommerce business provokes dilemma. In the recent scenario, developing a mobile app for ecommerce plays a vital role that helps customers to shop convenient time and place. Companies can grow business and can target audience from all around the world by employing an ecommerce mobile app. For this analysis, the requirement for ecommerce app development has raised day by day. The ecommerce business owner must concern with all advanced features that engage consumers globally. The idea of building a mobile app e-commerce business is an essential part of any online marketing. There are many factors that determine the cost of ecommerce app development, whether it is for Android or iOS platform. Before developing a mobile app for business, need to perform market research on customer demands, and successful app requirements. Business owners need to understand market research that aims to understand the reasons why customers will choose your mobile app for buying products. Know your competitors; it will benefit you a lot. Discover everything about challenges and continue to take notes, plan to stay ahead in the competition. From their methods, structures included, platforms, it turns on to the goods they sell, everything should know to you. It will benefit you to make your app diverse and enhanced and avoid the faults they have done. Including high-resolution product images can make peoples buy. High-quality images play an important role that helps to zoom and customers can look at the image briefly. Include social media sharing button, as it is the biggest advantage for your business improves branding by sharing on social profiles. The adoption of mobile apps in the ecommerce business arranged with multiple benefits as it helps to interact with the customers instantly within the mobile app. With the help of the mobile app, products can reach your doorstep easily through GPS enable, as it saves the time of adding shipping address manually. Companies can send push notifications directly to customer inbox and can create alters, offers and latest deals. 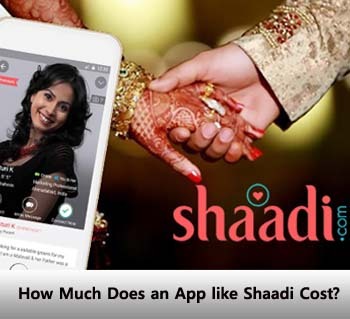 Mobile app helps to develop brand loyalty, as companies can send the latest offers, discounts, and rewards for a customer that made them connect with business for the long term. With the help of the mobile app, ecommerce companies can obtain detailed analytical reports and insights, which helps to improve sales and productivity. The significant advantage of mobile apps is that it enhances conversations between your employees, vendors, and consumers with constant support. 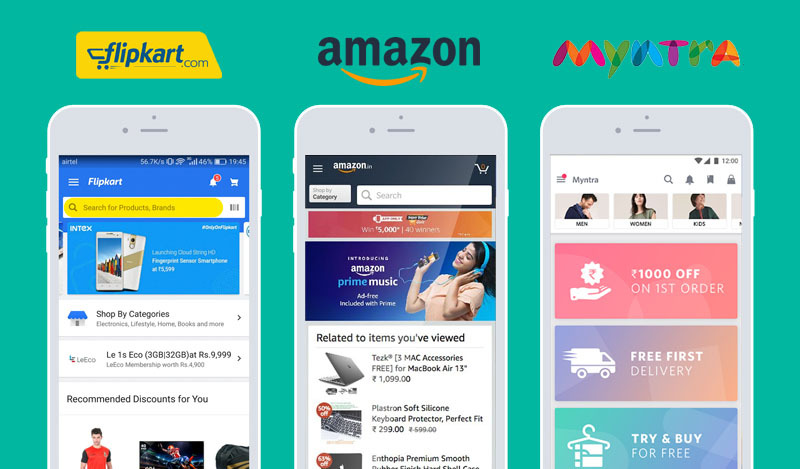 By integrating simple design, user-friendly structure, and pleasant UX, the ecommerce mobile app increases the engagement and conversion rate easily. Mobile apps are great tools for any business that attempts to understand a huge customer base. This feature enables the user to login via social media profiles or email accounts, through this process customer can save time compared to the risky process of registration. 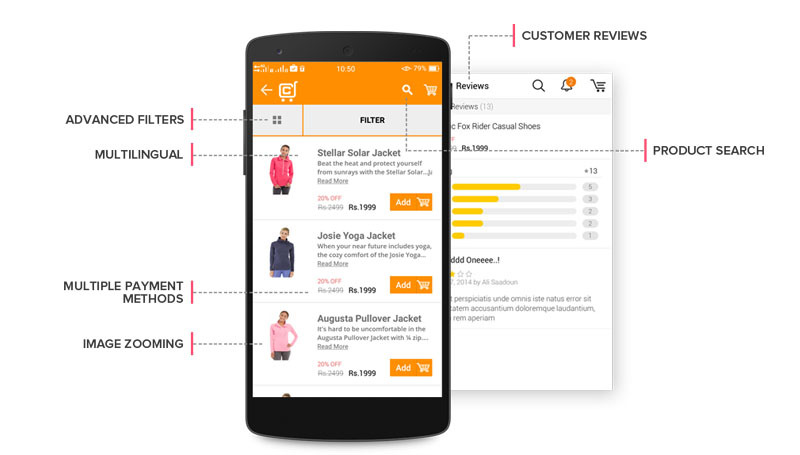 In the ecommerce app, the user interface is everything that users can interact with the UI controls, features, content, and functions. Push notification is a note that pops up on a device. Business owners can send their latest deals, offers, and discounts to the users directly to their inbox. Combining social features into non-social apps are an excellent method to correlate friends, develop networks, and hold users reaching back to your app. Most online shops choose to get shopping cart features for payment and transaction activities. The user can save the items in cart to buy later. An in-app customer service feature will enable you to manage these relevant data and advance the use of its decisions for your next marketing approach. Applying this feature, users can bookmark the things they want to purchase and can notify the users about the suggestions. The customers should provide with various choices of payment throughout the term of checkout with the highest confidence and security. The users should enable to review and feedback about products within the mobile app, as this will assist with the growth of your business. Adopting a mobile app for eCommerce business cost depends on various elements and functions involved in the app development process. To develop a mobile app for eCommerce store it needs a lot of experience and expertise that everything will take care of operations and attract customer’s attention. At Fusion Informatics, one of the leading mobile app development company in India and have vast experience in developing eCommerce apps with experts. We have the aim to take care of customer requirements and market demands that makes your business to reach a wide audience. 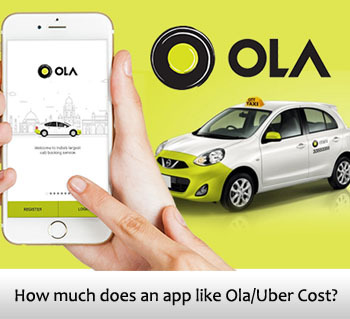 The user interface plays an important role in driving customers to their app. The more engaging your interface the added appeal to the audience. If the app interfaces, are not good enough, the company losing potential customers and business drastically. Determining cost provides the whole company a distinct impression of how much preparation and evaluation has to make. Moreover, our proficient team controls, building a mobile app for ecommerce from finding the unique methods of expansion. App platform: The ecommerce app development cost varies on choosing the various platforms to implement to target the audience. They are two platforms such as Android and iOS, as cost varies based on the type of platform choice. App design: The Cost of an ecommerce App depends on the kind of design you prefer, it is vital to grasp users by exciting them to conceive buying. The app must design to make the consumer experience pleasant. 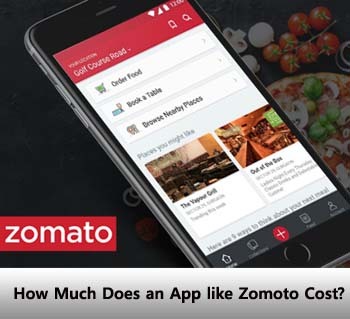 App size: The Cost of an ecommerce App depends on the overall range of a mobile app size and features involved in it. App Designer: Ecommerce App development cost varies with a reliable and proficient developer is necessary as his determining and expertise also influencing the development of the app. 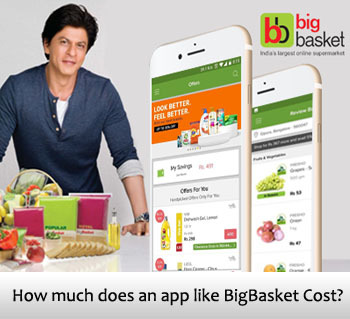 Basic features: The e-commerce app cost varies on user accounts, their buying carts, and order archives, review, and comments, is the basic feature that involves time and reduces the overall expenses of continuing a mobile app like this. Advance Features: Cost of eCommerce app varies with variations like data sync, geolocation, booking/transfer calendar, push advice alongside OTP confirmation, data transform, in-app calling/messaging. 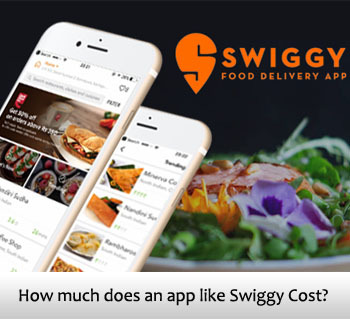 So, how much to develop ecommerce app cost? 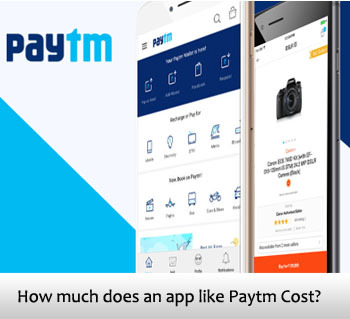 As in the case, every business owner wants to know the cost of development of the app for ecommerce. The questions will typically develop a series to grow up with a reasonable response. Before getting really strives, it is necessary to understand how the app designed to expand. After mentioning the above points still, there are some factors, which determine the cost of ecommerce app development, such as time taken for the overall development process, app performance and business model involved. The cost of eCommerce app development varies on various stages of the technical process involved and total time spent on app development. 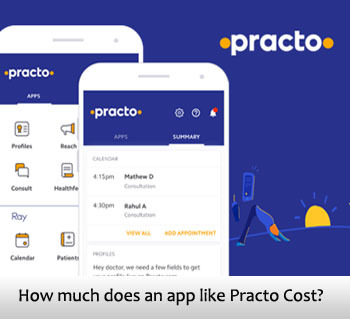 It is important to see at the various stages in terms of cost of app developer and the cost that wants to distribute at a specific stage. Analyzing all these factors, on average, e-commerce app development costs range between $5,000 and $ 200,000. 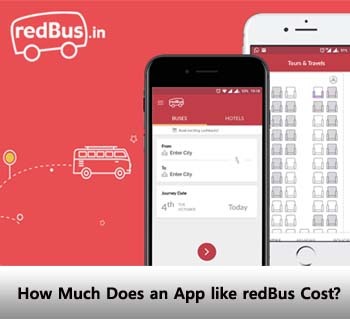 As discussed, the flexibility of its composition, the level of difficulty in the development, as well as the specific platform of the app are the main features that determine the cost of developing a mobile app. Fusion Informatics is a top app development company in India, providing the best services for users. We have the expertise team to understand the concept and entire needs of the customer that helps to bring high-quality apps. We use the latest technologies and tools that will use during the project. Every app we develop is done with certain market research and in-depth analysis of the latest technologies. We deliver the custom mobile app solutions that ensure the quality assurance process that guarantees seamless performance. Reach us at sales@fusioninformatics.com, If you are looking for reliable mobile app development company in India.